Anthony Calabrese, far left, Philip Dwyer, center right, and Jessica Gerber, far right, were re-elected Board of Education vice chairman, chairman and secretary respectively on Tuesday in Fairfield. 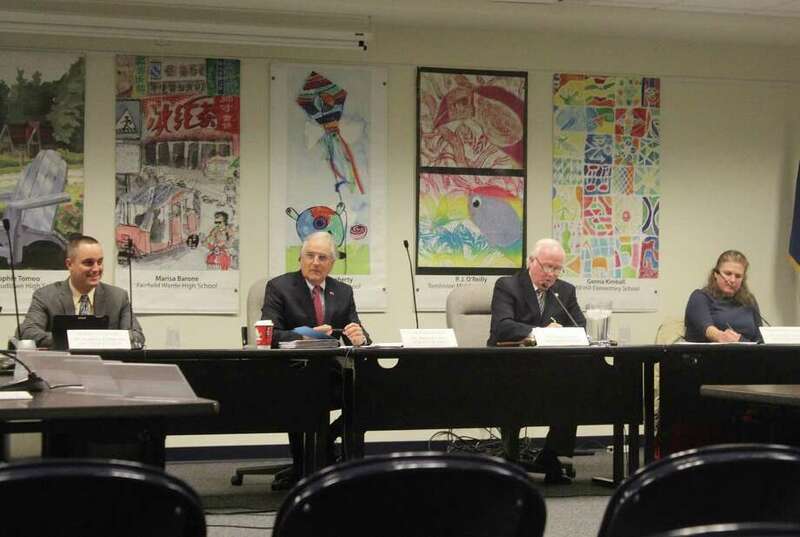 FAIRFIELD — Board of Education Chairman Philip Dwyer, Vice Chairman Anthony Calabrese and Secretary Jessica Gerber were all re-elected to their leadership roles during an annual vote Nov. 15. At the Tuesday night organizational meeting, the incumbents were each elected by a 6-3 vote with Democrat Donna Karnal and Republicans Eileen Liu-McCormick and John Llewellyn in opposition. The three board members often vote together. Calabrese, a Republican and recreation coordinator for the town, was elected vice chairman last November, a few weeks after he was voted onto the board for the first time. After Calabrese’s nomination this year, Liu-McCormack nominated a series of members for the role. Marc Patten, Karnal and Gerber all rejected the nominations. After Democrat Gerber’s nomination for another term as secretary, Liu-McCormick nominated Llewellyn for the role. Llewellyn was nominated for vice chairman last year. He lost both votes by the same 6-3 breakdown. Dwyer, who has chaired the board for several years, was the only member nominated for the top leadership post. The Democrat recently ran for state senator in the 28th District, but lost to incumbent Republican state Sen. Tony Hwang, R-28. While she did not make a nomination, Karnal opposed closing the chairman nominations and questioned why the majority of the board did not want a change in the chairmanship. She said she wanted to start a discussion on why the board felt it necessary to nominate the same chairman four years in a row. At last year’s vote, Liu-McCormick and Llewellyn nominated Karnal for chairmanship. The three board members voted against electing Dwyer and Calabrese during that election, though Gerber was elected unanimously.